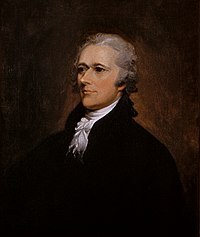 Alexander Hamilton (January 11, 1755 or January 11, 1757 – July 12, 1804) was an American politician, statesman, writer, lawyer, and soldier. He was the main author of the Federalist Papers, the first U.S. Secretary of the Treasury, and the son-in-law of Philip Schuyler, He was killed in a gunfight with Aaron Burr. "A national debt, if it is not excessive, will be to us a national blessing." Simple: If a country's debt is not too big, it will be good to us. This page was last edited on 26 October 2009, at 17:25.